March is National Craft Month and the perfect time to try out some new and quick up-cycling crafts. 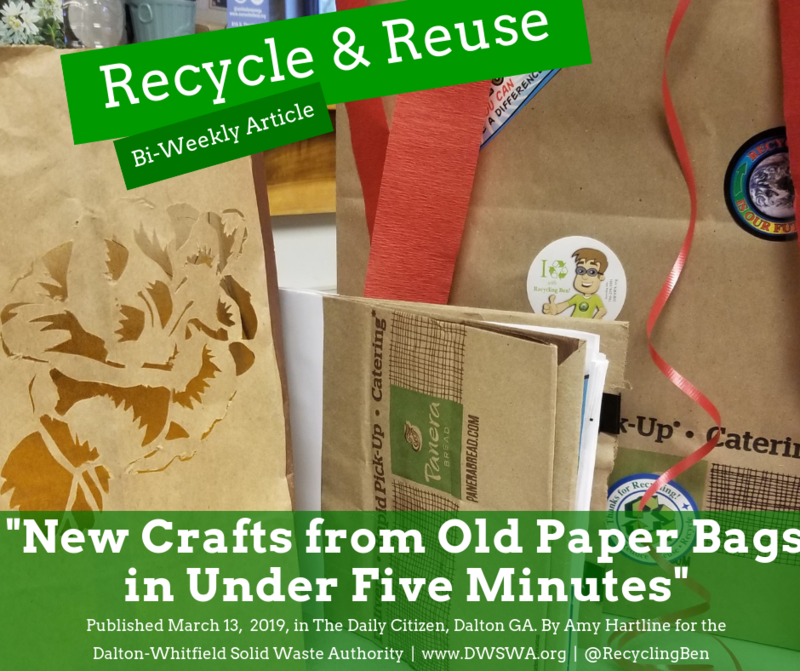 These paper bag crafts allow you to reuse an old item and then recycle it after. In one craft, you can practice reusing and recycling, that’s what this column is all about! The debate about plastic versus paper bags is ongoing some places still use paper bags particularly coffee shops or cafes. These bags are typically made from recycled material. Save up those paper bags this month and turn them into some fantastic crafts. · Paper Kite: This craft will have you singing, “Let’s Go Fly a Kite” in no time. This craft can be done with young children within a matter of minutes. Set up a paper bag, scissors, tape, one yard of string, and crepe paper or ribbon. You will also need items to decorate with including crayons, markers, or stickers. First, allow the children to decorate the outside of the bag using crayons, markers, and stickers. Then, attach strips of ribbon or crepe paper to the top of the inside using tape. You can have the child cut out the strips themselves, or pre-cut them before the craft. Finally, attach the string to the two sides of the bag using a strong adhesive or tape. Then they are all set to head outside and run the air through their new kite! · Luminary: Luminaries aren’t only for Halloween. Make a set of paper bag luminaries to line your walkway at nighttime for decoration for a party. To make these, you need a stencil and X-ACTO knife. You will also need tape, and, of course, paper bags. Tape the stencil onto the bag, the closer to the bottom it is, the brighter the design will appear. Use the X-ACTO knife to cut out the stenciled design and place a piece of cardboard inside the bag so that the design does not go through to both sides. Trim the top of the bag if you would like. Then weigh down the inside with an inch of rice or a few pebbles. Place an LED candle inside and you are done. The more luminaries you make the more dramatic an effect this decoration will have. · Paper Bag Album or Journal: Make a cute, small journal or photo album to carry around with you. You will need at least three paper bags of the same size for this craft. Grab a stapler or hole punch, ribbon, and a binder clip as well. First, layer your bags on top of one another alternating which side the opening is on. Fold the bags in half and secure with a binder clip. Make sure the bottom half of the first bag is your cover and on top. You will have the open end as the back cover which you can use as a sleeve. Then, you can either staple the folded side or punch several holes into it and secure it with ribbon depending on what look you would like the journal to have. Decorate your cover and put pictures or notes on the inside. Alternatively, you can follow similar steps to make the cover of the journal using one bag, but cut several sheets of paper to the size of the journal and staple them inside. Start collecting those paper bags today so that you can try out one of these fun up-cycling crafts for yourself. When you are done using your new craft, you can throw it in the recycling bin. The recycling center will handle it from there.